4th January from 8pm Limited tickets €5. 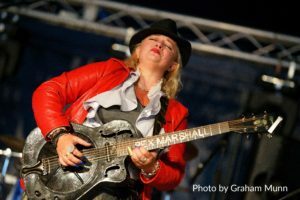 UK British Blues Award winner and 4 time European Blues Awards nominee Bex Marshall’s unique style of guitar playing is a combined technique of slide, blues rock, ragtime and roots pickin’. Her voice is a powerful melting pot of old black woman’ s heartache and rock diva soul. Bex is a writer of distinction and notability,she pushes the boundaries of blues, her songs have been called timeless, touches of genius, and now she tours internationally solo or with a three piece band which augments her unique style of virtuoso playing, Bex is literally a musical tornado She also picked up an award at the UK Blues Awards 2013 for Best British Blues Vocal and Album. A Devonshire lass now residing in London, the product of two very different family’s, one blue blooded landed gentry, the other Irish Romany. As a child at family gatherings her uncles would always play and stand her on the table to sing, at 11 years old she was given a 1963 Gibson Hummingbird by her Uncle David and started playing, she got hooked on instrumentals and classical guitar standards which stretched her fingers and gave her a great basis for her own music to develop, flamenco, ragtime, country chicken pickin’, rock and on to blues and roots where she is now in her element. She always had a passion for traveling, its in her blood and trained as a croupier at 18 began her travels around the world working gaming tables on cruise liners to Park Lane even dealing illegal poker games in Amsterdam. 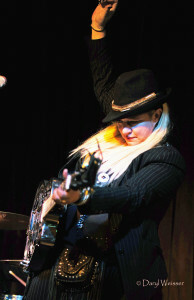 She hitch hiked the coast of Australia on cattle trains and always with a guitar on her back living and storing tales.